Watkins was born on 29 January 1907 in London to Colonel Henry George Watkins and his first wife Jennie Helen (d. 1928). While an undergraduate at Trinity College, Cambridge, he led the Cambridge University Expedition to Spitsbergen in 1927, organised to explore and map Edgeoya, the third largest island in the Svalbard Archipelago. The following year Watkins returned north on an expedition to Labrador, accompanied by James Maurice Scott, exploring and surveying in the upper reaches of the Hamilton River from July 1928 to May 1929. On his return, Watkins gained the support of the Royal Geographical Society for the British Arctic Air Route Expedition [BAARE], 1930 – 1931, organised to investigate the possibilities of an air route from Britain to the west coast of the United States via Iceland, Greenland, Baffin Island, Hudson Bay and Edmonton. Watkins proposed to explore the east coast and inland ice of Greenland, the least known areas along its course. Sailing on Sir Ernest Shackletons old ship the Quest from London in July 1930, the expedition reached Ammassalik in East Greenland, where a base camp was established. On 8 September 1930, a meteorological station was established on the ice cap at 67°05’N, 41°48’W, where a series of observations were conducted. Several exploratory flights were made, during which a range of high mountains was discovered, later named the Watkins Mountains. Sledging and boat journeys were made to survey and chart parts of the east coast of Greenland and to examine the ice cap of the interior. 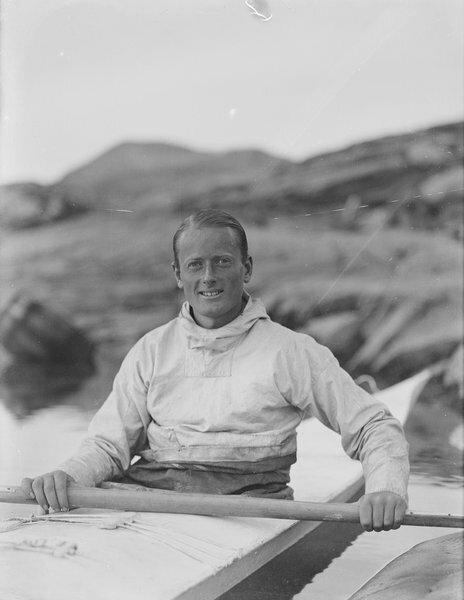 Already an experienced dog-driver, Watkins became skilled in the practice of hunting by kayak during this expedition, and demonstrated considerable ability in combining techniques learned from the Inuit and previous explorers with innovative use of modern technology. On his return to Britain in 1931, Watkins commenced plans for a Trans-Antarctic Expedition, but was unable to raise sufficient funding due to worldwide economic depression. He decided to return north on the East Greenland Expedition, 1932-1933, sponsored by Pan-American Airways to extend the work begun during BAARE. Watkins’ primary responsibility was to feed his three companions, John Rymill, Quintin Riley and Frederick Chapman, through his hunting. In August 1932, Rymill and Chapman discovered Watkins’ empty kayak on Lake Fjord where Watkins had been seal-hunting alone. His body has never been found; he was aged 25. Once it became clear that Watkins was dead, his three companions decided to stay on in Greenland to complete their work under the leadership of Rymill. At his death Watkins was engaged to Margaret Graham. The Gino Watkins Memorial fund was set up in his memory with the aim to inspire and guide enterprising, particularly young, people towards exploration and research in the polar regions. Watkins, H.G. (1928) The Cambridge expedition to Edge Island by Henry George Watkins, The Geographical Journal Vol.72 no.2 p117-143. Chapman, F.S. (1934) Northern lights – the official account of the British Arctic Air Route Expedition, 1930- 1931. London: Chatto and Windus. Dictionary of National Biography, 1931-1940 “Watkins, H.G.” (1950). London: Oxford University Press. Mills, W. (2003) Exploring Polar Frontiers: a historical encyclopaedia. Santa Barbara: ABC-Clio. Poulsom, N.W. and Myres, A.L. (2000) British polar exploration and research: a historical and medallic record with biographies 1818-1999. London: Savannah Publications. Scott, J.M. (1937) Gino Watkins. London: Hodder and Stoughton. This entry was posted on Friday, November 7th, 2008 at 11:34 am	and is filed under Biographies, Resources, Watkins Henry George [Gino]. You can follow any responses to this entry through the RSS 2.0 feed. Both comments and pings are currently closed.